Sales associates at carrier and big box stores are at the front lines every day, helping customers get a new phone, troubleshooting problems, and recommending the best Speck case for their needs. We wanted to reward their hard work, so in the fall of 2016, we ran a contest asking them to take a creative photo of a Speck case in the wild and share it on social media with #iSpySpeck. Our winner was Adam Brooks (pictured above), who won a trip out to Speck HQ and a weekend in San Francisco, CA. 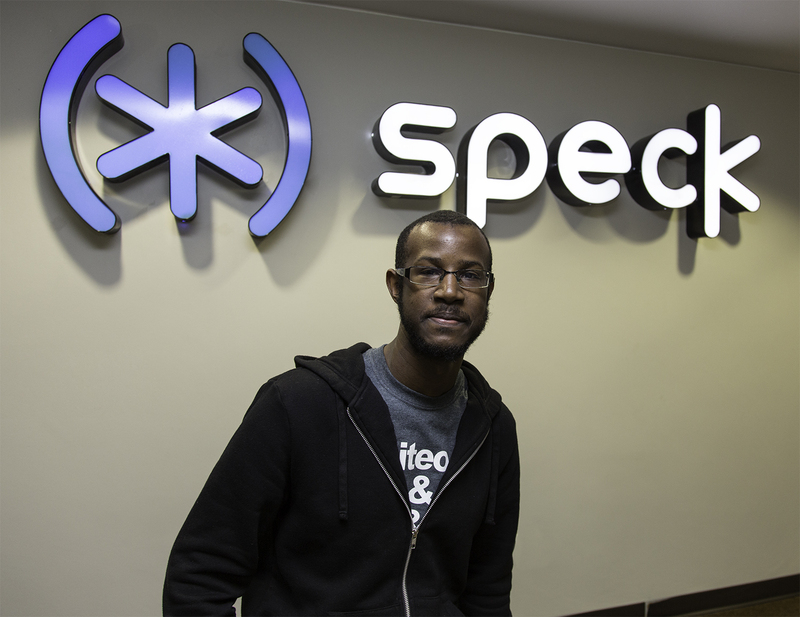 We sat down with him to learn about his job and what he likes most about Speck. You can check out his awesome winning post below. Speck: Hey Adam, welcome to Speck headquarters. Can you tell us where you work and what you do? Adam: I work at Verizon, and I’m mostly dealing with customers that come into my store to pay their bill, get a new phone, or troubleshoot an issue. Pretty often I’m helping someone get a new device. S: What’s your favorite part of your job? A: I really like troubleshooting — helping someone with a problem with their phone. They’re usually overly excited when I can resolve their issue, which makes me happy. They just want their phone working again because they have photos, memories and other important things they don’t want to lose. S: What’s your favorite thing about Speck cases? A: How sleek they are! The first thing customers ask for is a case that’s not bulky. When they say that, I know to show them a Speck case. S: What’s your favorite Speck case? A: I’ve always liked the Speck Clear cases, first CandyShell and now Presidio. Customers like them too because they come in looking for a particular color phone and they want to show it off. The first Speck case that caught my eye was CandyShell Inked Luxury with the shiny print. I really liked how that looked and bought one for my mom. S: When someone comes in looking for a case, do they typically know what they want? A: Some people have been using one case for so long, that they know exactly what they want in their next case. More customers lately have been looking for something with a grip, so that their phone feels secure in their hand and won’t slide around in their car or on their desk. S: What else are people looking for in a case these days? A: They usually don’t want anything that’s too big or bulky. Most people want a nice-looking case, that’s also protective. And more customers are asking for variety and eye-catching prints.